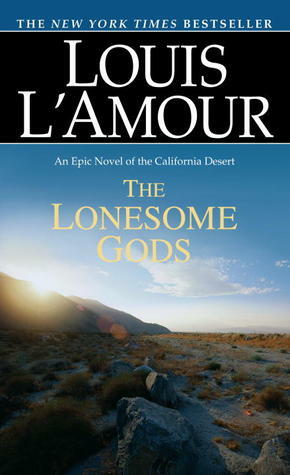 The Lonesome Gods is about a man named Johannes Verne. His mother and father were on the run from his mother's father, Don Isidro, who wanted to kill them both for disgracing the family name. But they escape and have Johannes, but when his parents die, Johannes is left in the desert to die alone by his grandfather. Johannes is forced to grow up mostly alone, but always he prepares himself for that day when he meets the men who had killed his father and who wanted to kill him, because on the day Johannes was left in the desert, he never forgave . . . and he never forgot. I would definitely recommend this book to others because it's suspenseful, daring, adventurous, and has romance, but it's really subtle. For those who enjoy reading tales of the Old West and gun battles, and who don't really want to focus on the romance, than this is the book for you. Johannes is also a very great, complete character, and anyone who gets to know him can't help but be in awe. Katniss Everdeen and Peeta Mellark are victors of the Hunger Games, and are going on their victory tour of the 11 districts. Things don't go very well, and a few districts rebel against the Capitol. Then, for the Quarter Quell Hunger Games, Katniss and Peeta (along with one male and female victor from the other 11 districts) go back into the Hunger Games. Katniss is then part of a bigger rebellion than she thought she was in and had already made. Catching Fire was an excellent book that made the movie in my head really interesting. I like how it is told from Katniss's point of view, so you know what she is thinking and feeling about the things that are going on. I would recommend this book to people who like action, suspense, and war. But I recommend that you read the first book, The Hunger Games, or else most parts in the book will not make sense. This book is about two people; Gideon, a galaxy renowned hacker, and Sofia, a brilliant con artist. When their paths collide one day, the pair is forced to work together to survive, all the while struggling to trust each other, and, ultimately, themselves. The two must find a way to overcome their hurdles and find a way to save the universe. I liked this book because it shows the value of choice, and how people are what they choose to be. It also shows how hard work trust can be, but how wonderful it is when it's achieved. The biggest lesson in this book, is how to still love after enduring so much pain, and how love is found in the most unexpected places. I would recommend this book to those who enjoy science fiction and romance stories. The perspective of the novel changes from chapter to chapter, so it may appeal to some readers.